Compiling a list of the 10 Worst Wall Street Actions of 2013 should be easy–there are so many to choose from! The problem is, it often takes years to see which financial activities and innovations have been the most destructive and destabilizing. Therefore, the following should be considered merely a sample of the ways Wall Street has maneuvered, manipulated, defrauded and deceived us during the past year. One of the most obvious examples of Wall Street influence on Congress was HR 992 to roll back some of the derivatives restrictions on banks. The NY Times discovered that Citigroup had drafted most of the language, some of which was accepted almost word-for-word. The House passed it with bipartisan support. Meanwhile, bank lobbyists had excessive influence on the agencies writing and enforcing the Volcker rule. The financial system in general, and the mammoth banks in particular, are still just too damn big. In 2013, JP Morgan Chase was the poster child for this problem, with its numerous legal problems, for which they set aside on the order of $28 billion dollars just to pay legal fees. The London Whale debacle, which involved Dimon lying to shareholders and Congress, showcased both how banks make their biggest money from pure speculation, and how they are enabled by lawmakers and regulators through their “Too Big To Fail” status. Banks like JP Morgan Chase and Goldman Sachs have manipulated access to commodities such as aluminum and electricity in order to increase their profits. The Federal Reserve has permitted the biggest banks to postpone complying with such regulations as still exist to limit banks’ involvement in commodities, or to ignore them altogether. Minimal fines the banks have paid are simply the cost of doing business and are far outweighed by the money they’ve made. The banks continued to exploit underwater homeowners. One of the worst abuses is called “zombie foreclosures” where the bank pretended to foreclose — evicting the owner — but then didn’t file legal papers. This allowed the banks to continue to rack up interest, fees and penalties because the homeowners, reasonably, stopped making payments because they thought the homes were no longer theirs. To add insult to injury, when the banks sent out checks to homeowners in restitution for past misdeeds, they bounced. Detroit’s largest creditors, UBS and Bank of America, made it clear just how far they’re willing to go to collect on debts from highly-risky interest rate swap deals they made with Detroit’s leaders before the 2008 financial collapse: they’re coming for the art! Creditors, led by Detroit’s imposed “Emergency Manager” Kevyn Orr, sent Christie’s auction house to the Detroit Institute of Arts to valuate the works, which are all held tightly in public trust by the city. It still remains to be seen whether the approximately $900 million works – we think they’re priceless! – will be sold off to pay off debts or in some hostage deal to pay threatened but constitutionally-protected city worker pensions. According to MSN.com, credit unions offer low rates on loans, higher rates on savings, better credit cards deals, and lower fees. Perhaps because of these competitive benefits, the American Banking Association ran an ad campaign to revoke the tax exempt status for America’s credit unions. There’s a familiar yet still outrageous lack of criminal prosecution for (pick your favorite settlement). But let’s concentrate on an exception that proved the rule, specifically what has been termed the “Bank of America/ Countrywide hustle”. Here Countrywide deliberately and desperately gamed underwriting standards to dump loans on Fannie and Freddie, and got caught. Worst of all, jury found defendants guilty in about 3 hours. If only more cases had been brought to trial: juries are chomping at the bit to find banks guilty. Which is probably why more weren’t. U.S. Attorney General Eric Holder was an egregious case study in how Washington kowtows to Wall Street. When JPMorgan Chase wanted to settle their many legal difficulties, CEO Jamie Dimon had a private meeting with Holder to negotiate; the final settlement involved admission of illegal activity by JPMorgan but no criminal charges — just fines mainly paid by shareholders. Holder also admitted to Congress in March that the megabanks were too big to prosecute. While he later retracted the statement, his actions — never bringing criminal charges despite admitted criminal activities — speak louder than his words. The banks, among other corporations, pushed for the Trans Pacific Partnership (TPP) treaty that will greatly constrain efforts by the U.S. and other countries to regulate. For instance, it would prevent the imposition of a “Robin Hood Tax” on stock trading, it would roll back some of Dodd-Frank and prevent a return to Glass-Steagall. TPP would also forbid public banks such as the Bank of North Dakota or a return of the Post Office Bank. No wonder we aren’t hearing more details. AIG’s President and CEO Robert Benmosche compared criticism of AIG bonuses to lynchings in the Jim Crow South. Mistaking a papercut for a crucifixion is the inevitable delusion of a pampered and under-prosecuted criminal upper class. Occupy the SEC‘s impact on the Volcker Rule (which originally aspired to banning proprietary trading and ownership of hedge funds by banks) could not be more evident. When the Volcker Rule was finalized in December, the hard work Occupy the SEC did writing a 325-page comment letter on paid off. The letter was cited 284 times by the regulators. In some cases, the final rule adopted their recommendations while in others the rule was modified in the direction of Occupy’s suggestions. Richmond, California Mayor Gayle McLaughlin ignited a fury on Wall St and in Washington by employing an eminent domain threat to force intransigent banks to renegotiate – and reduce principal – for underwater homeowners. The move has sparked everything from lawsuits and threats of mortgage lenders leaving town to copycat actions in other underwater cities as far away as Irvington and Newark, New Jersey. Supporters of the promising tactic are calling it the Reverse Eminent Domain Movement and even Occupy 2.0. Larry Summers did not become the new Fed Chair in 2013. 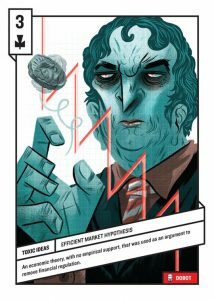 It was a close call but Larry Summers may finally have made too many obvious and ridiculous mistakes – deregulating financial derivatives to pave the way for the financial crisis, for one, and aiding criminal fraud in Russia for another – to be made, once again, one of the most powerful people in the world. Several journalists deserve extra praise this year for their coverage of Wall Street’s illegal and undemocratic behavior:: Matt Taibbi, Bill Moyers, Yves Smith, Gretchen Morgenson, the International Consortium of Investigative Journalism, ProPublica and Wikileaks. Taibbi alerted us to the HSBC settlement proving the drug war is a joke, Moyers highlighted how people can provoke change and, with Smith, exposed the dangers of the Trans-Pacific Partnership. Morgenson skewered payday lending and many other unsavory financial practices. The International Consortium of Investigative Journalism and WIkileaks exposed documents that the banks want to keep secret — for good reason — about enormous amounts held off-shore and TPP drafts.. 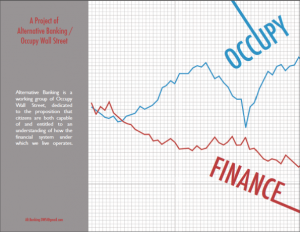 The OWS Alternative Banking Working group released Occupy Finance, a 100-page book explaining the financial crisis in layman’s terms on the second anniversary of Occupy, and supplies of the book were quickly exhausted (a new printing has been ordered for January 2014). In the past two months alone, Strike Debt’s Rolling Jubilee has collected and abolished $14.7 million in debt, as a means of raising awareness about the personal debt crisis, and a step towards building a debt resistance movement.